Oh, Mattel, you almost had me. I innocently scrolled up Twitter to see what was shaking. 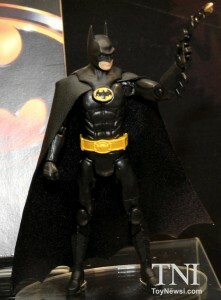 Following a few links, I discovered what appears to be Mattel-made action figures of Keaton Batman. Having completely forgotten I had already heard about this, for a moment I thought I was looking at a 6″ Movie Masters Keaton Batman. But no, it was just the previously-announced 4″ figures. Still, kind of exciting, I guess. Click the photo or this link to see photos of the other figures, including General Zod and Superman from Superman II, the Penguin and Catwoman from Batman Returns. The sculpts look great, it’s just…so small. Pretty neat. Mattycollector will also be offering more MOTUC Minis, including Battle Armor He-Man and Skeletor, Moss Man, Mer-Man and a build-a-mini-Castle-Grayskull. 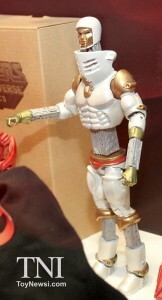 It looks like these figures are a bit smaller than the SDCC versions, however, which seems odd. Whatever the reason, it's confusing to customers. You have a 6" West Batman and a 4" Keaton Batman, arguably two of the more popular versions of Batman that millions of customers know and want, that kind of can't be used together. Why not make comics 4" and movies 6"? Mattel could have gotten fans in on a double dip of sorts in 2013 (finishing out the 6-inch line, and getting many to start collecting the 4 inch line) but, like Star Wars Black, it's too damn confusing. A 6" Keaton/Nicholson set and a 6" Ward/West set would be great Essentials for matty.com over the holidays. I collect most 3.75" so these little guys are right up my alley, and I'll probably be completist with them like I was Infinite Heroes for a while. But I feel for the DCUC collectors, it's a little ridiculous to snub the fans when they've been asking for these since the DCUC line started! Third, they take up less space. Fourth, more vehicles and playsets. I am a devoted 6" collector, but in no way am I like an X-Box/PS3 fanboy who thinks there is only room for one or the other. I agree with everything you just said. I especially love pairing them with large monster toys and such. So much photo potential. Also: Holy crap I'm gonna get a Joe-scale Michael Keaton Batman figure!!!! Very true DMW- I really enjoy collecting all scales, but my first love (and sad obsession) is the 3 3/4 stuff. I really like having a bit of everything. Click on my name and keep an eye out for my blog, which will focus mostly on 3 3/4 inch figures when it launches in a few weeks. Since getting interested in Star Wars Black, I've been looking at a few of the 3.75" SW toys. Every so often I pick up the "best" versions of my favorite characters. So far the only thing I've bought is the 2004 Original Trilogy vintage-style Han Solo, but I'm planning to nab the Chewbacca and the Boba Fett from that wave as well. That said, my heart still and, I think, will always belong to 6". Oh man, did they mess up Julie Newmar? To be fair, these look a LOT better than the first batch of 4 inchers we were marketed when the downsizing thing started…. … I just don't want 'em. Man, those 4" figures are so infuriating. I have been collecting 6" movie superheroes dating back to Spider-Man 1 and I have no interest in a new scale. The sculpt work looks fantastic, but what I've loved about my collection is being able to mostly pose them all together, from ToyBiz, Hasbro, and Mattel. It's so frustrating to see them tackle the movies from my childhood but be so collector unfriendly with it. This scale has always seen really trashy, subpar figures right through Man of Steel. Why reverse course and focus on it for something that will mostly appeal to collectors, not the kids at Target. There is a place for both, but this is mixing messages in the worst way. They won't be. Why is there relief on Reeves' 'S'? They clearly still have no idea what they are doing. and probably cost just as much. Which is part of the problem. They can't be as bad as those Injustice figures. It's gotta be a Matty cash grab: release the figures fans have been clamoring for so long in a smaller, cheaper scale, we'll obviously pay whatever obscene accessory-less price they wind up charging for these, then we'll get the 4HM sculpted movie master versions we wanted in the first place and end up buying these things twice. It's too bad Hasbro isn't releasing these. Mattel has no business making figures in this scale. I actually don't mind the scale, since I collect 3.5 / 4 inch figures too. If these were cool, I'd be all over 'em. But I'm pretty sure articulation on these is still gonna be pretty weak. They look like they've got less than the 6' DCUC figures. And, for the record, Hasbro's GI Joe and MU figures have been largely ahead of the DCUC figures in terms of articulation and sculpting, for the longest time. Ah, Mattel. The only steps you ever take are steps back.